Looks like these days everyone is making fun of Opera. I saw someone joking about a new Pirate Bay browser saying it will be better than Opera. I think people are so harsh on Opera because they see it as another chromium ripoff with no real addition. Opera made a bold move by moving to Blink and Chromium and rushed to release the new browser to jump in the browsers race. The result was a browser carrying Opera’s logo without any of its unique features. The good thing is, new features are being implemented in the developer preview (Opera 17) like gestures so obviously it’s a matter of time before the browser you love give you back the features you have been using. I was excited when I heard of Opera’s move to Webkit then to Blink. I believe Blink/Chromium will benefit from the Opera’s contributions because Opera already has done a lot to the web. It was the first browser to pass ACID2 test and was ahead of other browsers on implementing and propsing HTML5 features. For those who didn’t use Opera before or those who forgot, please allow me to give Opera some credit for some of its great features and for the contributions they made to make the web the place we know today. Opera was the first browser to give us the plugin-free synchronization for history, bookmarks, passwords … and everything. It’s called Opera Link. All you need is a free Opera account. It was done automatically in the background once you log in. The information is synchronized to Opera mini too. That was awesome at this time. 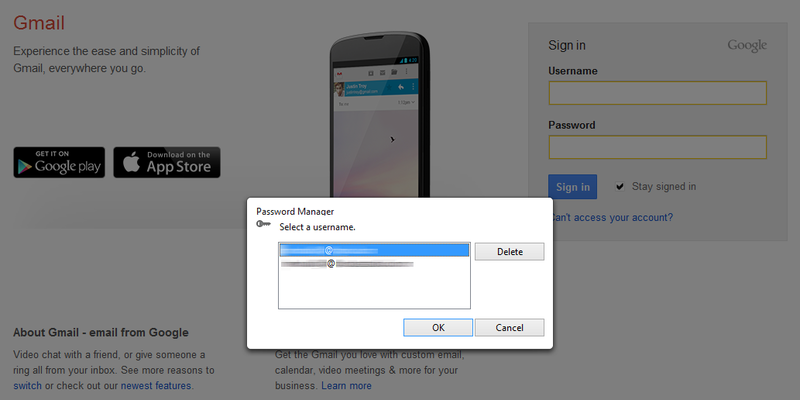 Opera allows you save multiple combinations of usernames and passwords per domain. Simply hit Ctrl + Enter and you will get a list of the available options you can use to login. Other browsers either allow you only to save a single username / password and if you tried to save a new one it will replace the old one or wait till you enter the username nad it will complete the password. This is very helpful for example on hosting CPanel where you can save passwords to access webmail, CPanel login and PHPMyAdmin without being afraid one will replace the rest. This is an issue every browser is still having problem with. When the amount of tabs you open grow beyond control. Opera introduced Tabs stacking that allows you to group tabs together and easily expand / collapse them. This was useful in grouping tabs with similar topic together to save the space. Gestures allows you to perform common browsing actions with small, quick mouse movements. You can also define your custom gestures or modify the default ones. This little feature has been saving users’ time since 2001! Opera was the first browser to provide true page zooming instead of just enlarging the text. It expanded everything on the page, including text, images, videos and other elements. This is a killer accessibility feature for people with impaired vision. Once the content goes beyond the view port; Fit to Width fix the display and eliminate horizontal scrolling. I loved that because I remember back in 2004 I used to visit a lot of forum where people could post images with huge dimensions. Fit to Width immediately fix that. Till today this isn’t available anywhere else. On the same menu there was an option to turn off images completely or to load images from the cache. For a lot of people a feature like this might not be so important because of the bandwidth but for others this is essential if they’re on limited bandwidth. It is simple sitting one click away from the user. If the image is not cached, it will not load. Till today this feature also isn’t available in any browser. Opera allows you to select any part of text on the page whatever its display property was set to. To understand what I mean take a look at the image on the right. The part on top presents Opera and the part at the bottom presents Chrome. As I said Opera allows you to select any text on the page. Other browsers will fail to select elements that have their display property set to block or inline-block and will start dragging the element. There are a few small things I loved in Opera. These were small things people might not notice until you start using other browsers. Like hitting the back button; Opera was the first browser that returns you to the same state you were in. The page will appear immediately without any delay or loading. Other browsers will reload the resources again and will fail if the previous page was a post submission and ask you for confirmation to post the form again. Opera’s slogan is the fastest browser on earth and it really was. 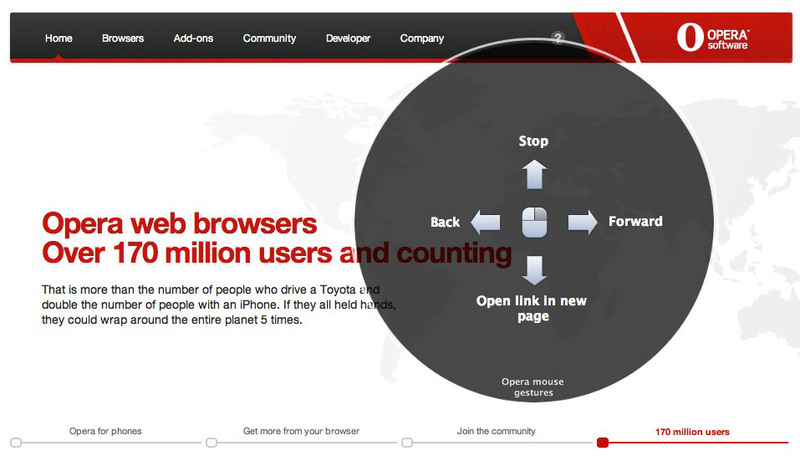 From the first second the browser start recieving data, Opera allows you to start interacting with the page. You can scroll and select text even before the DOM tree finish loading. Opera had a built in adblocking features. User can define anything to block on the page, including images, scripts and other resources. Simply by right clicking on the page, and selecting “Block Content”. Then you can simply select the elements you want to block. Opera also had a nice set of tools including native RSS feeds manager, email client, IRC client and download manager with BitTorrent support. I only used the IRC client twice as far as I remember but I didn’t have to download one to use it. When I needed it, it was on my browser. There’re a lot of other rich features that make Opera a uniquely awesome browser. I could go on with the list forever. What I am trying to say is, Opera is a great browser. It just need sometime untill they bring all the awesomeness to the new version. People should have some patience and value the efforts being put into it.